A fixed term plan lets you select a term from three years upwards. A guaranteed fund is offered at the end of the term. Take as much income as you need or even the whole fund safely over a number of years. Flexi-access drawdown plans let you access your fund easily, using a cash or smoothed growth fund for a higher return. Take an income, one off lump sum or move to another provider without penalty in the future. What are flexible income plans? Flexible income plans are written under flexi-access drawdown (FAD) rules to allow you to retain control of your fund and are an alternative to buying a lifetime annuity during a time when pensions are changing since the Budget. The two routes you can take would be a fixed term plan (also known as a fixed term annuity) for a period of time from three years or more. There is no limit to the amount you can take other than the level of tax you would pay. At the end of the term you receive a Guaranteed Maturity Value (GMV) so this route is very low risk. An alternative is flexi-access drawdown that is more flexible than a fixed term plan in terms of taking income at any time or moving to another provider at any time. You can place the pension in a deposit fund which is low risk or a smoothed growth fund if you can take slightly more risk for a higher return. Both these plans allow you to take your tax free lump sum and and leave the remaining fund which you can access in the future. After taking your tax free lump sum from the flexible income plan, decide if and when you wish to draw an income as this may determine which option would suit you best. With flexi-access drawdown or a fixed term plan you do not need to commit to a lifetime annuity now when rates are low and expected to rise. Rates are based on the 15-year gilt yields and these increase with rising interest rates. As a rough guide if interest rates were 1.5% higher the 15-year gilt yields aould increase by about 150 basis points and annuities would improve by 15.0%. The Bank of England expects interest rates to rise to 2.0% over time, possible over a five year time period. example for a person aged 60 years with a fund of £133,333.34 and after taking a tax free lump sum now leaving £100,000 for drawdown. An income can be taken from £Nil with no maximum. As an example, a lifetime annuity could provide an income of £3,640 pa based on a 100% joint life payable monthly in advance and this income can be matched by both flexi-access drawdown and the fixed term plan. For flexi-access drawdown you have the choice of depositing the fund in cash or a smoothed growth fund. The following shows a smoothed growth fund taking an income of £3,640 pa to match the annuity over different durations from 1 year to 10 years. 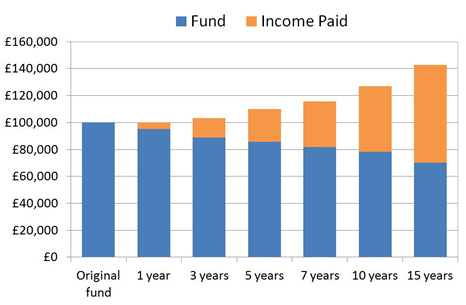 Source: Sharingpensions.co.uk research. This drawdown chart is for a 60 year old with a fund of £100,000. Combination of fund and income paid of £3,640 pa.
For flexi-access drawdown, the smoothed growth after charges is 4.0% per year which is added the the fund on a daily basis and this providing a very low level of volatility for a growth fund. Over a five year term the fund would reach £119,360 and pay total income from this of £18,200 leaving a residual fund of £101,160. This assumes the growth in the fund of 4.0% per year can be maintained. The fixed term plan can also match the lifetime annuity income of £4,850 pa but does not have any equity investment. The growth in the plan is guaranteed and it offers a Guaranteed Maturity Value at the end of the of terms from one to ten years. The longer the time period the better is the return. 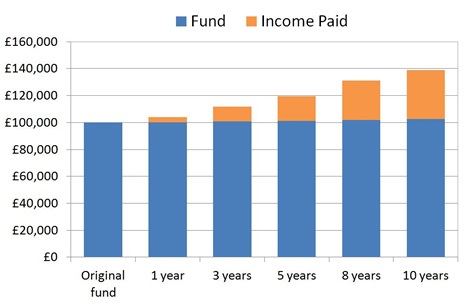 Source: Sharingpensions.co.uk research for a 60 year old with a fund of £100,000 on a 100% joint life and monthly in advance. Shows the combined GMA at the end of the term and income of £4,850 pa paid over different terms. For the fixed term plan, the return varies and improves with longer terms from 1.9% per year with a term of 5 years to 2.4% per year with a term of 10 years or more. The fund at the end of the term is guaranteed and there is no risk so this route offers a lower return than flexi-access drawdown using a smoothed growth fund where there is a higher risk element. Over a five year term the fund would reach £109,981 and pay total income from this of £24,250 leaving a residual fund of £85,731. For both flexi-access drawdown and fixed term plan, if the fund was used to buy an annuity the rate would be higher than today as you would be 5 years older. Annuity rates may also be higher if interest rates rise and poor health can also increase the rate. A fixed term plan is suitable if your fund is £20,000 or more before tax free cash and this increases to £30,000 for flexi-access drawdown. You can select a low risk fixed term plan, a safe deposit fund or higher risk smoothed equity fund depending on your time frame.